New York, New York. One of the most buzzing, vibrant cities in the States, if not the world. There are many wonderful aspects to living amid the hubbub of modern life, surrounded by inspiration, creativity and excitement. But sometimes… you just need to get away for a weekend – to experience nature, fresh air, quietude. Here are five of our top weekend getaway destinations just outside NYC for you and your special someone, for a romantic two days like no other. 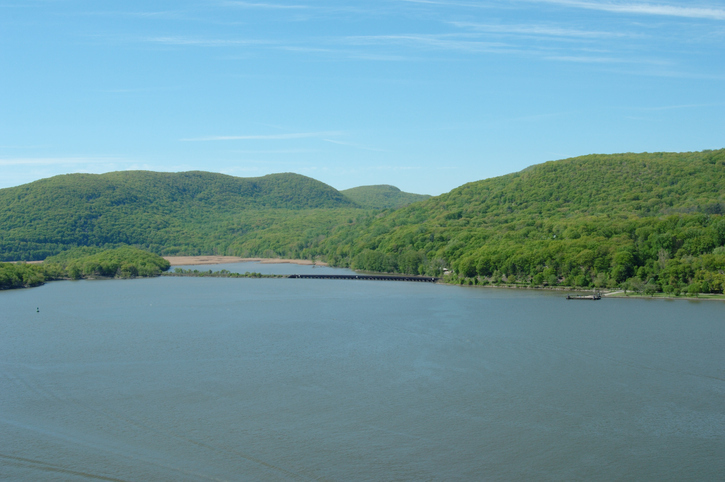 A cinematic state park situated within the rising mountains on the west bank of the Hudson River, Bear Mountain is the ultimate quick-fix escape from the madness of the metropolis. It’s so close, in fact, you can get there in the time it takes to cross town during rush hour! Unleash a week’s worth of stress in any one of the numerous adventure activities the park offers up. With biking and hiking trails galore, lakes and rivers (with fishing access), a zoo and a pool, what more could you need to let off steam? Bear Mountain is an inevitable tourist attraction during the summer, but this is more than made up for in the quieter seasons by its proximity to the city, as well as by the sheer volume of fantastic activities on offer. After a day’s excitement, stay in the historic Bear Mountain Inn. With specials running all summer, its luxury guest rooms, spa and restaurant make it easy to see why it has been frequented by no less prestigious guests than Eisenhower, Truman and Eleanor Roosevelt. This small town is characterised by endless stretches of idyllic beaches, priceless ocean views and olde-worlde charm. Have dinner and cocktails at the elegant Scarborough Fair, a lounge and restaurant wonderfully set in a refurbished farmhouse. For the most romantic, authentic experience, kick back and stay at Beacon House, a grand late-1800s seaside inn just a block away from the ocean, and bursting with genuine Victorian charm. Not only is the inn extremely affordable, they offer very reasonable peak-season rates, too. This Ulster County hamlet, tucked away in the Catskills, is the definitive melting pot of cultures and people. Where else can you spy a retired, conservative old-timer sitting side-by-side with a Staten Island lumbersexual, both sipping beers in perfect harmony? For every staple diner along the main street (the inimitable Phoenicia Diner springs to mind), you’ll also see numerous hipster newbies popping up, such as the promising up-and-coming Graham & Co. The mellow, no-frills atmosphere of the local culture makes it simple to instantly slip into relaxation mode immediately upon arrival: the town has no pretence, and therein lies its charm. Float down the rapids of the creek (facilitated by the excellent Town Tinker Tube Rental and their all-in-one packages) and sleep beneath the stars at the sublimely-situated Black Bear Campground on the Esopus Creek. The campground, simultaneously rustic and modern, offers all manner of activities, from swimming to biking, horseback-riding to hiking. The uncontended ultimate spot to unwind. Unreal views of the Shelter Island Sound and Gardiner’s Bay are complemented by the gentle history of this midsize island, a mere 7-minute ferry crossing from Greenport, NY. Visit historic plantations and the Mashomack Preserve, one of the Northeast’s richest habitats. With over 2000 acres of tidal creeks, freshwater marshes and mature oak woodlands, this is the definitive location in which to lose yourself and forget your metropolitan troubles. 12 miles of undisturbed, curving shoreline combine spectacularly with views comparable to those of the French Riviera. Centre-stage on the island is the perennially popular Sunset Beach Hotel, whose rooms, each with its own private sundeck with water views, have aided the relaxation of island-goers for decades. With rare plants, birdwatchers and kayaking, this is one for the more nature-loving adventurers. This seaside destination boasts some of the most unspoiled, gorgeous beaches along the entirety of the East Coast. A hub of old-fashioned fun and entertainment, rediscover your inner child during the summertime carnival season, whose unironic joyousness peaks on the Fourth of July weekend with an impressive, gigantic fireworks display. The good times go on for the whole of the season, though; the city, famous for its opulent Victorian architecture, is host to myriad boardwalk vendors, and the dolphin-spotting tours are simply unmissable. For a truly unique experience, head to the quaint nearby town of Green Creek, where Jersey Shore Alpacas (trust us, it’s real) host their Open Farm Saturdays. The alpacas are amiable, and more than happy to accept a carrot or two (these are provided – you’re not expected to traipse across town clutching a fresh bunch of veggies). In terms of where to stay, you really cannot beat the 200-year-old Congress Hall, the US’s oldest oceanfront resort. With over 100 magnificently-bedecked rooms, along with a bar, restaurant, lounge, outdoor pool, fitness center and spa, you will be at the forefront of all that is luxurious but simple comfort. For a little extra, book into one of their Atlantic-side rooms for the ultimate oceanic viewing experience. So, what are you waiting for? Come Friday, pack that bag, switch off your cell… and get away. And, as always, for more dating advice or information on how we can help guide you on your dating journey, get in touch.